Three New Rotarians Make it Fifty (50)! 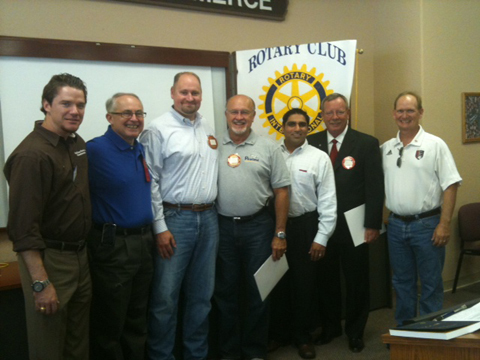 The Rotary Club of Friendswood inducted three new memebers on August 24, 2011. This brings the club membership to a new high of 50! watch what we do! The Rotary Club of Friendswood inducted three new members on Wednesday, August 24, 2011. In this photograph, Allan Rasmussen (President-Elect), Gerry Stacy (President), Richard Harris (New member), Andy Rivera (New member), Kam Hasmukh (Membership Co-chair), Bill Holbert (New member) and David Smith (Membership Co-chair) are all pictured after the induction cermenony.